The Worth of a Soul – Life! A couple of years ago I was drawn into the Repartee Gallery in Bountiful, Utah. I was letting my mom have a nap before I went back to spend more time with her. I scanned the shop and was instantly drawn to a Liz Lemon Swindle painting of Christ holding a young African boy. As I read the story of the painting , my eyes filled with tears. You see, Liz Lemon Swindle had been to Zambia. I was so touched because Zambia is where my baby served most of his mission and there is something deep in my soul that tells me that we might serve in Africa, too. That day I wanted to buy a large framed print for Alex. I settled for a matted 5″X7″ and found a frame at Target. For me, I purchased a small card with the print on one side and the story on the other. It has had a permanent place in my scriptures ever since. Each time I looked at it I longed for a larger one for my home. In May, I decided I that I couldn’t wait any longer. I ordered a print and finally took it to be framed. I got it back today and it is gorgeous. Now, I just have to decide where to hang it. I want to be able to see it often. P.S. Alex, are you jealous? Of course! I would be less jealous if you gave my family a trip to your home so we could see it! That small one you bought us sits on our mantle in our living room. It is a great reminder of my memories in Zambia as well as what it truly means to love everyone. 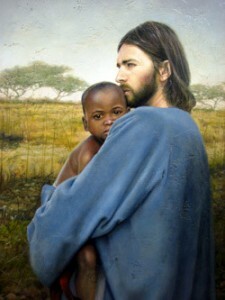 I agree that this is a beautiful touching painting! It does move you! Such a great painting. My Dad lived in Zambia when he was little because my Grandpa worked in the copper mines. P.S. I would be ecstatic if you served a mission anywhere in Africa – for obvious reasons.